Enjoyable, clever, though perhaps not remarkable fantasy woven around Irish myth. When ten-year-old Pidge picked up the old manuscript from the bookstore, he had no intention of unleashing an ancient, evil serpent, or of starting a battle between the forces of Good and Evil, or of hurtling himself and his little sister Brigit into a world of Irish lore. But now the goddess of Death, the Morrigan, is after the serpent, and if she gets it her evil power will be doubled. To stop her, The Dagda, Lord of Great Knowledge, sends Pidge and Brigit on a quest to find a lost pebble stained with the Morrigan's blood. If they find it, they can destroy the serpent; but the Morrigan has sent her deadly hounds in pursuit of the two children, intent on running them down before they complete their mission. Very good. Pidge and Brigit are a lovable pair; though Pidge is only ten years old, he worries most for his sister and is always intent on keeping her safe through thick and thin. They are both respectful and fond of their aunt and, unlike many main characters in children's fantasies, don't lie to their elders. (While Pidge does stay quiet about the manuscript, he does so for fear of endangering others or in the belief that they won't believe him anyhow.) Brigit is brave and also a little naive, and has no qualms about standing up to people and telling them what she thinks. An ingenious array of creatures align themselves with "Good" and help Pidge and Brigit on their quest. The Morrigan and her two sisters are evil, manipulating humans, lying, and creating discord for their own amusement. The whole of the story is set up around Irish myth and lore, and a flavor of Druidism pervades the writing. The children are at one point helped by a Druid; a character says that St. Patrick (who wrote the manuscript Pidge discovers) must have been a powerful Druid himself to have trapped the serpent, and though Brigit protests, it is still implied that he was. Various Irish gods are part of the story, including Angus Og (the god of love), the Lord of the Waters, and The Dagda, who is portrayed as a good, omniscient and omnipotent god. These gods can often shape-shift and are symbolized by different objects, like the daisy. Characters of Irish legend also show up or are mentioned, including Cuchulain and Queen Maeve. The Morrigan uses sorcery and Pidge and Brigit are given various magical articles to help them on their way. Animals talk in the Faery-like dimension through which the children travel. It is stated that the Hounds will kill the children if they can, and of course the Morrigan is intent on darkening the world with her evil; however, there is really very little violence. The most intense part is where the children run afoul of a giant (the Glomach) who wishes to cook and eat them. There is a large battle in the Glomach's cave and characters are killed (or seem to have been killed: in the Faery-world, it is sometimes difficult to tell). The children do discuss with a fox the ethics of breaking into coops and killing chickens. A minor character, a sergeant who gets mixed up in the fantastical affair, drinks "poteen," an illegal whisky. He thinks his habit of drinking too much is making him hallucinate, and it is implied that he stops drinking. A character is infatuated by the Morrigan, but that is as far as it goes. Brigit calls people and things names, but they're never crude. At one point she says she's "looking for that bloody pebble," which is literally true, though Pidge points out disapprovingly that she just wanted to say the word. 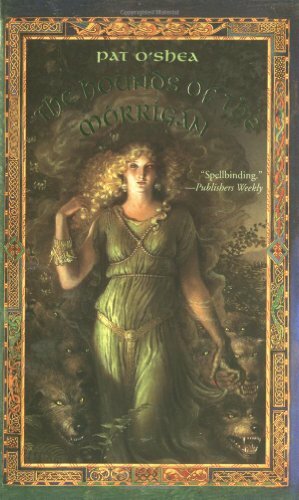 "The Hounds of the Morrigan" is a classic of children's fantasy, blending Irish legend with a dramatic journey and quest. It is also massive for a children's novel: over 600 pages, with many characters, sub-plots, twists, and building episodes. This can make the story a little tedious and, at times, difficult to follow, even with the glossary of Irish places and characters. On the other hand, "The Hounds of the Morrigan" does manage in many ways to avoid being cliche. Pidge and Brigit are both bricks, young enough to believe in magic, but, in Pidge's case, mature enough to grasp his situation. The minor characters are equally brilliant, though often bizarre: the authoress, rather than settling for the usual cast of talking dogs, cats, etc., introduces talking frogs; talking earwigs (who are actually adorable); talking spiders (also adorable); and a talking fox. If anything, the cast is too large and colorful, for some of them begin to seem a little superfluous. If you happen to be looking for a fat but not unduly dark fantasy, this one may be your cup of tea. It is difficult to recommend it to its age group (11+), however, owing to the deeply Druid worldview and the thickness of the verbiage. It is not hard reading, but neither is it fast-paced or always intensely engaging. You may find it right up your alley - or you may find it intensely boring.